All that posting about the Indian Kabab Dinner made me starving for Indian Food, so I followed through on my plans to eat Indian for lunch. We ended up going to Indique and luckily the weather held off long enough for us to finish our lunch outside on the balcony with a nice view of Cleveland Park. I ended up having the Chicken Tikka Makhani, the Mini Dosa, and a couple glasses of Viognier and I can't think of a better lunch I could've had today. It was very yummy! Check out the pix I took in my photo album. As many of you know already, Chef Sudhir Seth changed the menu over at Passage to India in December. 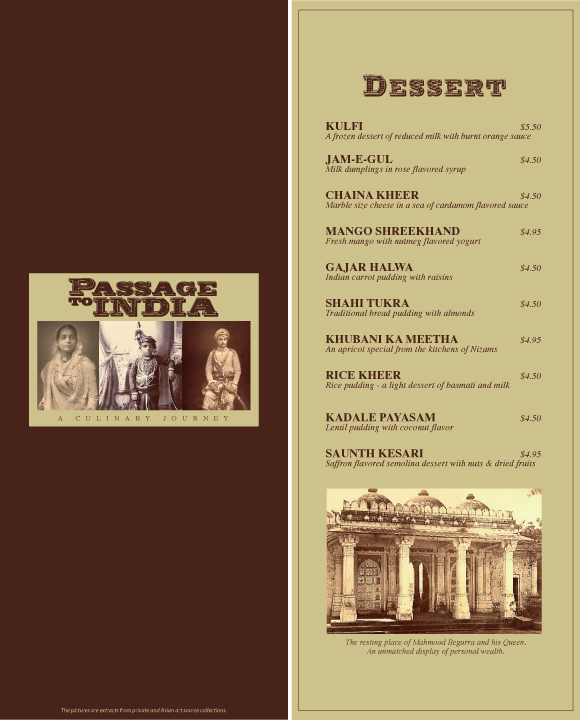 If you had been to Passage to India before then, you'd know that their menu prior to this was nothing to be ashamed of. Chef Sudhir took a risk by making the drastic changes to his menu that he has and I'm happy to report that the change of menu is definitely for the better. 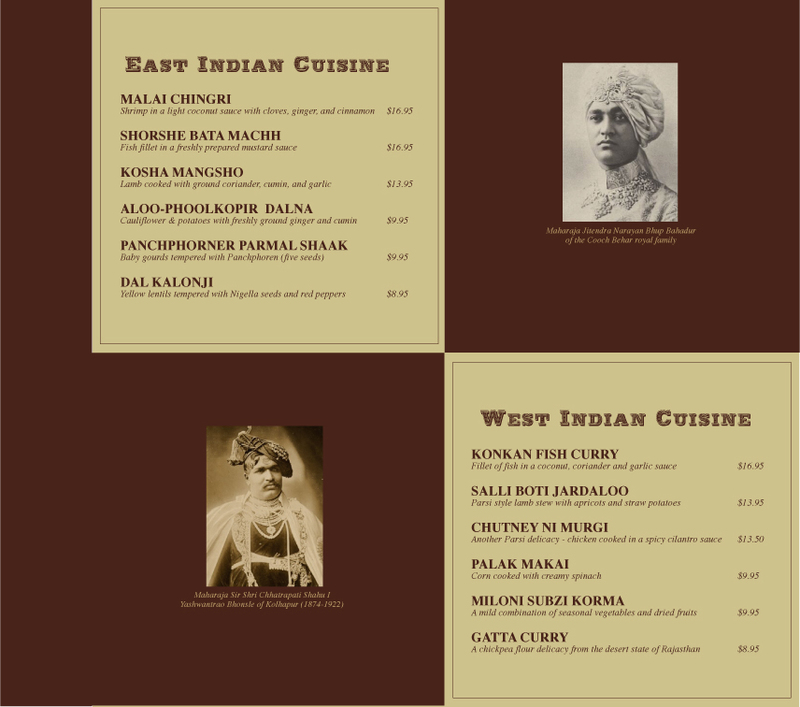 The new menu is divided up among the different regions of India – North, South, East and West. 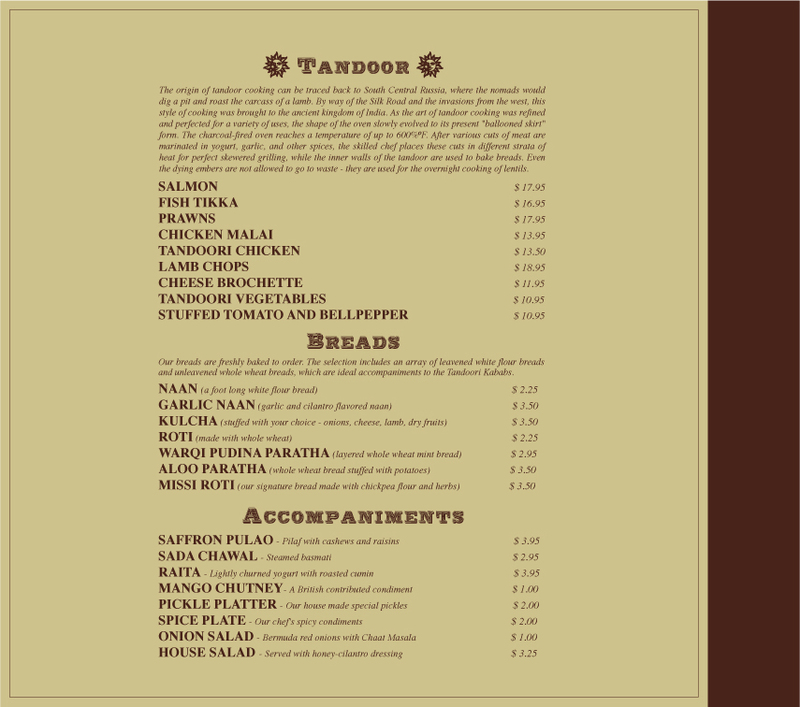 Missing completely from the new menu are the usual Rogan Josh, Paneer Makhani, and Chicken Curry. 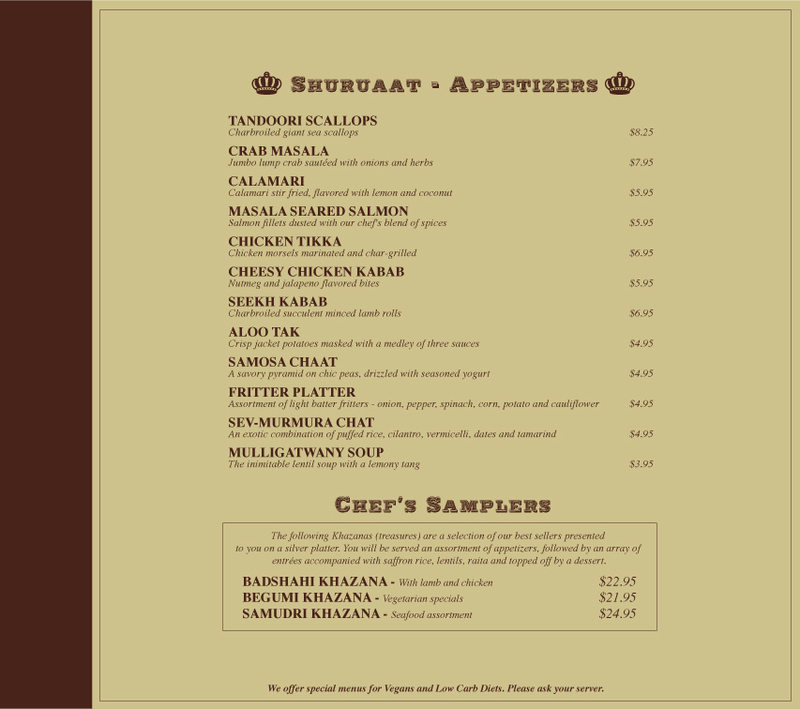 If you look at the East and West section of the menu below, you'll see that a majority of the dishes can't be found at other Indian restaurants. With dishes like Shorshe Bata Mache and Panchphorner Parmal Shaak from the East or Salli Boti Jardaloo and Chutney Ni Murgi from the West, Chef Sudhir is giving us the chance to increase the depth of our taste buds. 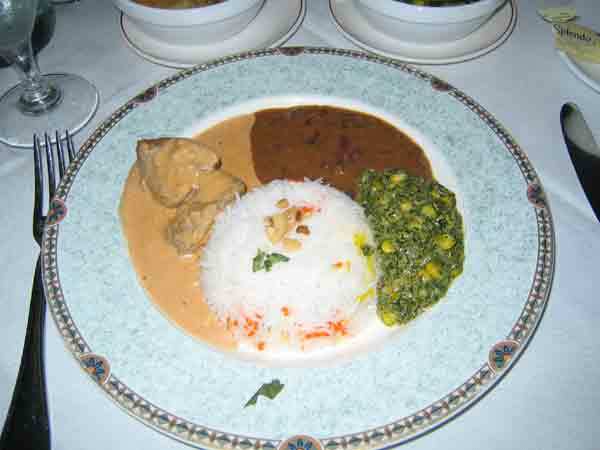 Most dishes that we're all used seeing in Indian Cuisine are from the North and South of India. 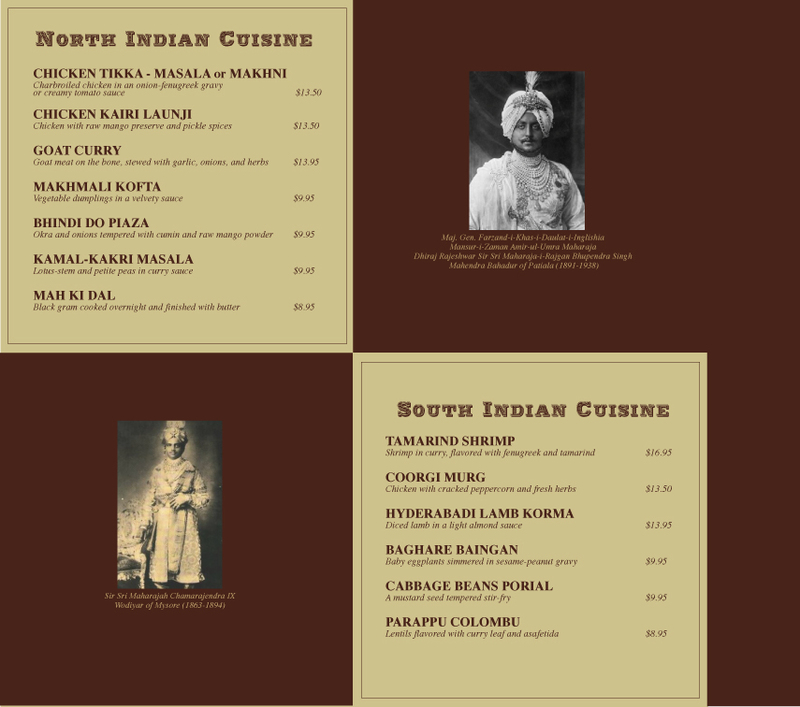 So if you are looking for some of the more traditional Indian dishes (traditional in the sense that they are more common to Indian restaurants in the DC area), you can order from the North and South menus. Passage to India still has Lamb Korma, which Chef Sudhir would be crazy to remove. I believe it's the best I've ever tasted. One of Phyllis Richman's recent articles backs this opinion up as well. Also, the classic Chicken Tikka-Masala still remains on the menu. Chef Sudhir says, "I originally wanted to leave it (chicken tikka-masala) off, but people complained enough about us not having it, that I had to leave it on." Now that I've told you about the menu, let me tell you about my experiences there. Sadly, our first attempt in December at sampling the new menu wasn't very successful. We were very excited to try the menu and there were many dishes that we wanted to try – So many, in fact, we couldn't decide which to order. Instead, we both decided to order one of the chef's samplers. The chef's samplers weren't a sample of the dishes that we'd wanted to try unfortunately. Most of them were the dishes that we'd had before. DOH! So if there was one thing I'd improve, it would definitely be the sampler dishes – but that's about it. Our second attempt two Fridays ago went much smoother. Luckily, we made a reservation for 8:30 PM, because when we arrived, they were pretty busy. This time we ordered differently. For an appetizer, I went for the Crab Masala. For $7.95, you get jumbo lump crab meat mixed with chopped onions, tomatoes, cilantro, tumeric, and other Indian spices wrapped in a papadam. The crab was very tender (and no shell!) and much better than I thought it would have been – plus Chef Sudhir didn't scrimp with the lump crab. Amy ordered the Samosa Chaat which is actually another dish carried over from the previous menu. We'd had it before, and as last time, it was wonderful. The samosa was full of spices and it was topped with just the right amount of chutney sauces. Other restaurants tend to pour on the chutneys and raita, which turns this dish into more of a soup than anything else. The samosa also came on top of a bed of chana (chick peas with curry). One other thing worth noting is that Passage to India's samosas are never greasy which is a common complaint we have at other Indian restaurants. Each appetizer came with a small side salad which you could actually eat and use to cleanse your palate. At most Indian restaurants, the garnishes are barely edible. Now I get to the good part - the entrees. My entrée, off the West menu called Chutney Ni Murgi, was an interesting chicken dish served in a green, homemade chutney cilantro curry sauce. The menu referred to it as a Parsi delicacy. This wasn't the spiciest Indian dish I've ever had, but not every Indian dish needs to take a layer of cells off your esophagus for it to taste good. I'm sure the next time I go, if I want it spicier, they'll gladly make it so. (Hehe, “Number One, I'd like my Chutney Ni Murgi extra spicy this time - Make it so.”) I really thought this dish made the meal for me. The chicken was lean and very tender. I also had a side of the aloo paratha to go with it. For those of you who don't know, aloo paratha is a potato-filled whole wheat bread. The potato filling is pretty much the same thing as the filling that goes into a vegetable samosa. I like to take a mixture of the curry and chicken, mix it with some rice, put it on a piece of the bread and shove it in my mouth. It makes for a great combination, although it can be quite messy sometimes. Amy had the Makhmali Kofta off of the North menu, which is called Malai Kofta at other Indian restaurants we've been to. The prime ingredient in this dish is the vegetable dumplings with a mixture of ground vegetables formed into balls and fried. They are then mixed in a yogurt and coconut-based sauce with a mixture of spices. Amy commented to me that she thought the dumplings were a little dry, but when I tasted it, I thought they were perfect. They had soaked up the sauce nicely. Once we were done with our meal, Chef Sudhir came out to say hello. It turns out he's a regular reader of this site. Go me! We talked to him about the new menu and congratulated him on the successful change of format. He mentioned that the weekends are usually crowded, but during the week they aren't very busy. So if you are looking for a good mid-week meal, or you want to avoid the weekend crowd, try going during the week. We had our usual rice pudding for dessert, which was dumb. Chef Sudhir actually has some desserts that sound really interesting, unlike most Indian restaurants. We really should have tried the Indian carrot pudding or fresh mango with nutmeg flavored yogurt. Better yet, we should have had the bread pudding. AAEEEEHHH! I can't believe I missed that. Oh well. Next time. I'll be returning soon to try some of the other dishes that peaked my interest. Our last trip, the bill was fairly reasonable at around $80. That included a Taj Mahal, a Paul Smith Organic lager (which I have to say is a great beer! ), 2 appz, 2 entrees, and a single dessert. Compared to other Indian restaurants in the area like Haandi, Heritage India and Indique, it is pretty much equal in price. All of these places are a bit more expensive than your average Indian take-away on the corner, but they are well worth the extra cost. See my previous post on Passage to India for full restaurant details. JennyUptown at eGullet points us to an article at The Post where Monica Bhide unlocks the secrets of chicken curry. About a month ago, you might have noticed that I wrote a post about how I ate three Indian Meals in 36 hours. One of those meals, you might remember was at Passage to India. You will also remember that I said that I had a great meal there. Well, Amy and I went again last Monday, and it was yet again...wonderful. This time, we went for Brunch...Well, I guess it doesn't really count as "going for brunch" when you only intend to go out for lunch, and when you get there, they happen to be serving brunch. None the less, we were happy to see that Passage to India was serving brunch and we decided to order it (just a side note, the brunch is not normally avaialable on Monday, but since it was Labor Day, they were serving it again). As we were ordering, the couple at the table near us was finishing up and raving about how good their meal was. There were about 10 people in the restaurant, and everyone looked very satisfied. The brunch offering at Passage to India starts with an appetizer sampler with mini samosas, Indian chicken salad, and those onion fritter things (I'm forgetting the exact name for them right this minute). They also give you two sauces to eat them with - One a plum sauce and the other a raita. The raita went especially well with the chicken salad. 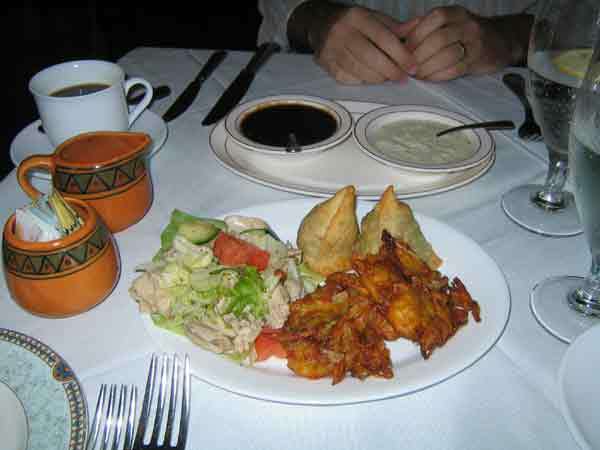 In the picture on the right, you can see the chicken salad on the left and the samosas and onion fritters on the right. Nothing's really new or different here. These are your typical Indian restaurant appetizers, and they would probably be safe just serving the samosas, since they are probably our favorite samosas around. Honestly though, I would rather see some of the chaat that we saw at the Indian Street Food event, but I understand why they serve the appetizers they do. For the entree, you have a choice of chicken tikka masala or lamb korma. On top of that, they bring out daal and saag. Mix them all together, and you get a pretty good combination. The lamb korma here is one of my favorite around as far as kormas go. The sauce the lamb is in is very creamy and spicy. It is very similar to that of Heritage India (which makes sense since Passage to India used to be a Heritage India), except it is spicier and hence - better. I had the lamb korma the last time we went to Passage to India, and it was a little better, if I remember correctly. On the left you can see what my plate looked like. From left to right, you see the korma, daal and saag. Amy ordered the chicken tikka masala, and it was good as well. We also love the saag dishes here. Last time, Amy ordered the saag paneer and absolutely loved it. There was no bread included in the brunch, so we ordered some paratha, which I have to say is right on as far as I think paratha is supposed to be made (at least as far as my limited knowedge of Indian food goes). For dessert, Passage to India includes two dishes of rice pudding. Once again this was very good as well. I could taste the strong cardamon flavor and it was very creamy. Mixed in with it were pistachios and raisins - A very nice touch I have to say. One thing about Passage to India - They charge you for rice. This is the same practice that Heritage India follows and it drives me nuts. 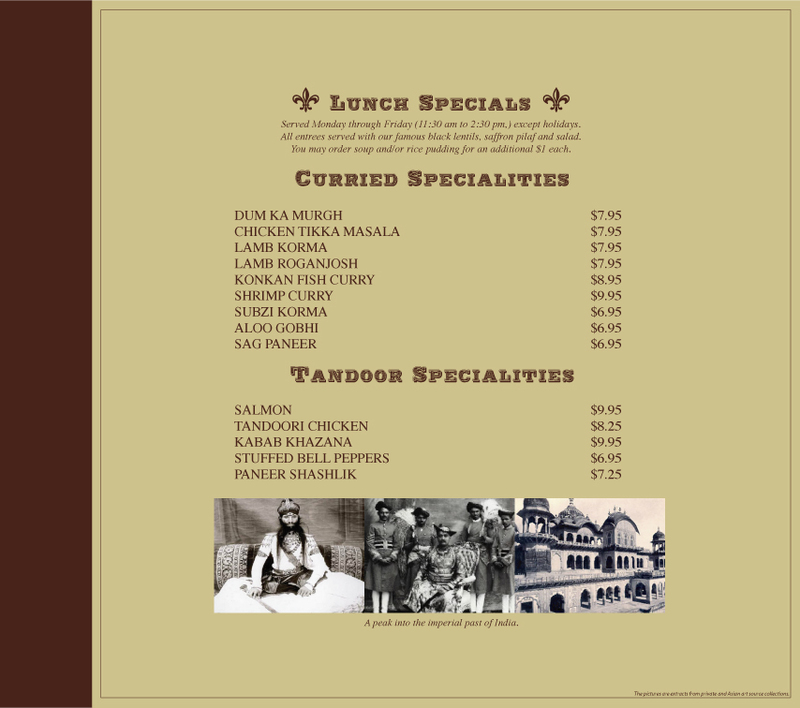 Update: Passage to India not longer charges for rice on their new menu. The brunch cost $24.95 for two people, plus the cost of the bread and coffee we ordered. The coffee, I have to say, was very strong which we appreciated very much. Not a bad deal for a Sunday (or Monday) brunch for two. I also shouldn't forget to mention how good the service is at Passage to India. The servers are very attentive, timely and gracious. See what Monica Bhide wrote about Passage to India at the Washingtonian.